Same great qualities as the Deluxe Money Blowing Machine, but without the frills. The original design is for easy portability and proven functionality. It is assembled in less than 5 minutes without tools. It’s lightweight, durable and portable. 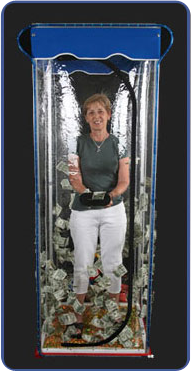 The Standard Money Machine is easily shipped and stored by collapsing to 30” wide x 5” high x 30” deep. The blower is industrial grade and the circular motion prevents money or coupons from piling up in one location inside the booth. 5-year manufacturer warranty. Weight: Enclosure 42 lbs., Blower 46 lbs. Cash Cubes are a great time at a great price. If you need money machine promotions then give us a call at (386) 871-2625 or fill out our contact form.